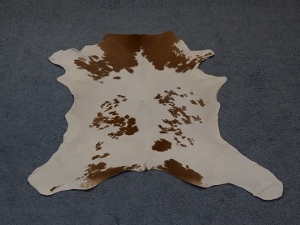 We offer a nice selection of chrome-tanned hair-on calf skin rugs from Peru. These skins average 4 to 7 square feet. They are about 2 to 3.5 feet long and 2 to 2.5 feet wide. 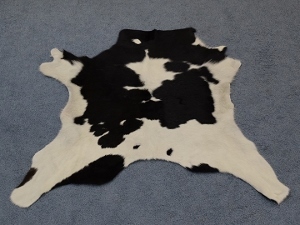 The undersides are a light blue tint from chrome tanning. Some skins are patch-free and some have small patches. A few skins may have scrapes on the back side. 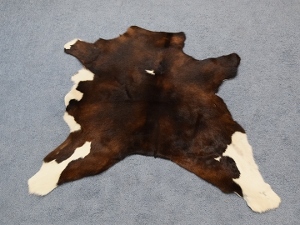 We are particularly pleased with the quality of the tanning from the Peruvian tannery. Genus and species: Capra hircus. Ranch/Wild.